Stonegate At Crossings Crossings Homes: Soon to be FEATURED ON HGTV HOUSE HUNTERS! This majestic courtyard pool home in the heart of Naples featuring 3,577 square feet in the main home and an additional 510 square feet in the cabana which can be used as a separate mother in law suite. Major curb appeal at the end of a stately cul-de-sac on over an acre of land, this lot evokes Pine Ridge Estates living in the gated community of Stonegate. Four bedrooms with two and a half bathrooms in the main home, and an additional bedroom and bathroom in the guest house provide plenty of room for family and guests. Unique features include a grand chefs kitchen covered in granite and beautiful cabinets, separate covered and screened in patio areas for the guest bedrooms and the master bed, a summer kitchen in the courtyard, grandiose 1,468 sf travertine covered pool deck, a 250 gal propone tank servicing the kitchen range, fireplace and summer kitchen. The expansive pavered circular driveway surrounds an elegant water feature and leads to the roomy 3 car garage. New roof in 2017, recently updated finishes and large open spaces, this home is ready for your buyer's personal touches to make it their own. Mill Run Crossings Homes: Sophisticated elegance inside and out of this sprawling 4BR+ study, 4 bath family home nestled on quiet cul-de-sac street with a picturesque southern exposure preserve setting. Every high-end quality detail has been thought of including NEW ROOF (2019), gleaming Travertine stone floors in living areas, solid wood floors in bedrooms, solid core 8ft doors, 12ft plus ceilings, rich cherry built-ins in study, 1,250 bottle climate-controlled wine cooler, tongue & groove ceilings in family room and master, mahogany front doors, 3-way gas fireplace, trey ceilings, crown molding, cove lighting, and plantation shutters. The heart of the home is the sunny open cook’s kitchen/family room with huge windows, large center island, 6 burner gas range, high-end cabinetry, glass inserts, pull-outs, granite counters, stainless appliances/hood. Enjoy sun all day on lanai with beautiful custom pool, spa, waterfalls & mosaic tile wall, and built-in gas grill. Spacious master suite and guest rooms with marble baths. Exquisite professional landscaping with stone waterfall, bougainvillea trellis and towering twin Medjool Date Palms. Freshly painted, hurricane shutters, and 2 buried propane tanks. Mill Run Crossings Homes: This beautiful custom home was the builder’s private residence. Completely remodeled in a warm coastal contemporary style with every detail completely updated. Well appointed gourmet kitchen with stainless steel appliances, granite countertops, and breakfast bar. Open floor plan that combines kitchen and dining areas with living room and great room areas to provide functional space for entertaining. Oversized master bedroom with vaulted ceilings and master bath with large walk-in closets and renovated master bathroom with dual vanities. Additional bedrooms are large and provide abundant natural lighting. Great room has sliding doors that open out to a "negative-edge" pool with absolute privacy and tranquil long lake view. 3-car garage with built-in shelving and work area. This home offers hard surface flooring throughout, has been meticulously maintained and is in pristine condition. Current owners added on to the home with a home office/den in 2017, kitchen & living room renovations, new AC in 2018, new roof in 2019. Mill Run Crossings Homes: Beautiful pool home conveniently located in the gated community of Mill Run at the Crossings. This neighborhood conveniently located in Orange Blossom offers low fees, a community pool/spa, tennis courts and play area. Property meticulously maintained now ready for a new owner. The home features a bright open floor plan with split bedrooms and large living room and pool area perfect for entertainment. Heron Pointe Crossings Homes: This waterfront pool home on a cul-de-sac with preferred SW exposure is not your traditional 2-story. Originally 4 BR + Den + Bonus Room, this home has been remodeled with lots of charm and character, to have the main level a wide open great room with one of the two first floor bedrooms converted to a convenient laundry/hobby/sewing room with a closet. The master BR has lanai access, a large walk-in closet, dual sinks and separate shower and corner soaking tub. The former walk-thru laundry is now a butler’s pantry with a wet bar. The stairwell was opened up, which now lends itself to all kinds of kids playing, pet containment or storage ideas. The upper floor has two bedrooms, a full bathroom, a loft area, a den plus a huge Bonus Room perfect for dancing, yoga, exercising, or watching TV. Wonderful tropical landscaping, hard surface flooring in the entire house (great for kids and pets!) and a lakeside pool with attractive awning all add to the appeal of this one-of-a-kind property. Located in the convenient little neighborhood of Heron Pointe in The Crossings in central North Naples with all A-rated schools, extremely low HOA fees, and also featuring a community pool. Heron Pointe Crossings Homes: Welcome to this ready to go, move in now 3/2 pool home in one of Naples' top school districts. Low HOA fees and pet friendly too! An inviting tropical exterior and a quarter acre yard marked by gorgeous coconut palms and shady hardwoods greets the homeowner, friends and family alike. Inside, you'll love the updated kitchen sporting custom granite and wood cabinets all over looking the wide open great room and spacious pool area. Enter or exit the pool area from three sides including the great room, master bed and master bath. Relax in the immediate sense of privacy. Enjoy safely strolling the private community streets and utilize the amenities including a full sized pool, community room and basketball. This beautiful home is one of only two 3/2 pool homes within miles available under $375,000! And...seller will provide one year home warranty. See it now! 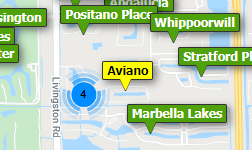 Need professional assistance selling your property at Crossings Naples? Find out how an Area Specialist can help to generate more property exposure in order to get the most money for your investment in the least amount of time.